Warren Beatty needs a second chance. 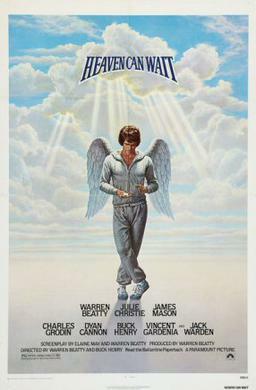 Quarterback Joe Pendleton (Warren Beatty) is nearly killed in an accident when an over anxious angel takes his soul before its time. Reincarnated as a millionaire whose wife (Dyan Cannon) and secretary (Charles Grodin) have plotted his murder, Joe falls in love with environmentalist Betty Logan (Julie Christie) while leading his old football team back to the Super Bowl. This film is a remake of a 1941 film Here Comes Mr. Jordan, which I can say beats out the original. Despite my dislike for Warren Beatty I found myself trying not to be too taken back by his presence and really that wasn’t a problem here with this film. The film’s gags and jokes are reminiscent of old screwball comedies from the 30’s and 40’s. I enjoy films that go back in time for their comedy but still make it funny in the recent time and this film does a good job at it. The only problem with this film is that the comedy is just not always there. I does succeed in its attempts to be funny but at other times I think it tried and din’t go so smoothly. The screenplay for this movie is smart with a very slight touch of irony which was played out good. The only problem I have about the screenplay is that when it starts going towards the romantic scenes I couldn’t help but laugh at how corny some of the lines were. Lines such as ” I can’t stop staring at you”, and “I can’t imagine a life without you” are used and I felt were way too corny. One important thing that this film shows is the themes of life, death, love and humanity. I think this film best signifies these themes and handles them with such care to where it doesn’t become preachy but touching and something we can all relate to. Warren Beatty does do a very good job in this film but it’s not great and I feel like every time he plays the same guy in every movie just with a different tweak. But he does alright but a lot of the supporting cast do very well and showing these stuck-up people for what they are. Consensus: Though labeled as funny it is at times but not too much, but shows a perfect portrait of lives that can change with powerful themes about life and love.